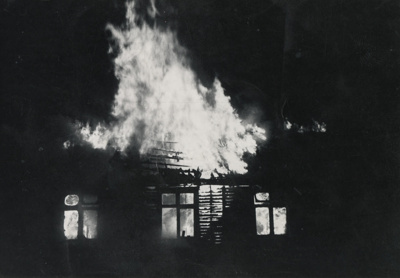 This photograph was taken during the March 1967 hostel fire at the Awarua Radio Station. Believed to have been started by an electric blanket in one of the centre rooms of the hostel, with the occupant waking to find his room full of smoke. Along with one of the other residents of the block, the room occupant attempted to put out the fire with fire extinguishers, however, after this was unsuccessful, at 6.11 am the fire brigade was called. When the Invercargill Fire Brigade showed up at 6.23am the building was engulfed in flames and it took five deliveries of water and 20 minutes to get it under control. By that stage, 80-90% of the building had sustained damage. With only 8 of the 24 bedrooms being saved. Many of the 15 men living in the hostel lost all of their belongings and were given clothing by their co-workers and the Salvation Army and while most the accommodation had gone up in smoke, a crisis was averted with board or billeting quickly being arranged for those who no longer had a bed. Handwritten on back in black pen: 'HOSTEL FIRE, ZLB 2599-006'.